When you need lapel pins made in USA, who ya gonna call? Lapel Pin Superstore, that’s who! 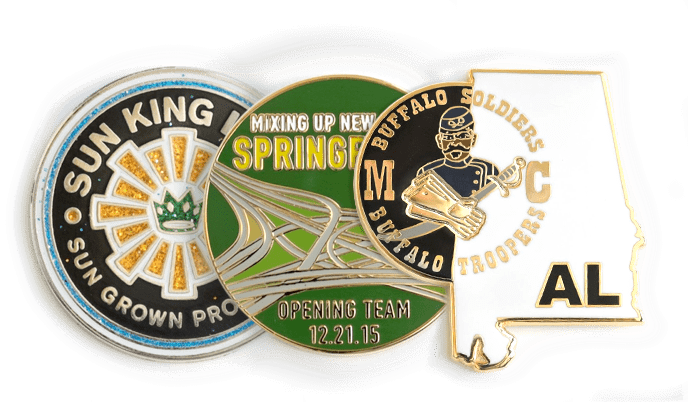 We are your best source for USA made custom die-struck lapel pins. If you want to support American manufacturing AND get fantastic looking custom lapel pins, we are your best bet. We can supply the finest quality die struck pins you can buy, made with pride by American workers right here in the United States. Our graphic artists will work with you to perfect your pin design. With a range of pin sizes, metals, shapes and options available, we can turn just about any design you can imagine into a terrific looking die-struck pin. Our die-striking process gives you a better, more detailed look than a casting process can. We will email you a digital proof of your custom lapel pins made in USA design before we begin production. You can revise the proof until your pins look exactly the way you want. Once you approve the proof, we’ll complete the metal die, including hand-finishing it to create the best, most accurate representation of your design. Once the die is ready, we strike your coins using a high-powered hydraulic press. Once each coin is struck, we add color, polishing, and/or any options you want. The final step is to inspect your lapel pins made in USA by hand before we ship them to you. At Lapel Pin Superstore, we believe in offering you the most value possible. That’s why we use the finest materials and state of the art equipment. It’s why we offer to match or beat a lower price quote you receive for identical pins. It’s why we support our pins with our 100% Satisfaction Guarantee. If you find any custom lapel pins made in USA defective in either workmanship or materials, we’ll replace it at no extra cost to you. That’s what our commitment to customer satisfaction is all about! View our price chart below to see examples of our custom USA-mad lapel pin pricing. For more details about pricing for additional sizes and shapes, give us a call, toll free, or fill out our Free Quote form. We look forward to serving your custom lapel pin needs! Stock shapes are: round, rectangle, oval or square. Custom shapes incur a $250 mold fee. Want to know more? Fill out our no-obligation Free Quote form. It only takes a minute, and we’ll reply within 24 hours or less with a custom quote specific to your lapel pin design. Let us show you how great your custom die struck, lapel pins made in USA can be!